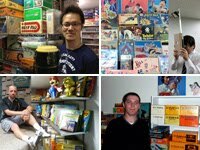 An important attribute of the Nintendo design philosophy - established in large part by chairman Hiroshi Yamauchi and engineer Gunpei Yokoi - is to ride the waves of new technology in a way that creates new play opportunities that are affordable (for the customer) and profitable (for the company). The orginal Gameboy and the Wii are prime examples of this: not the most advanced in their time in terms of technology, but great fun nonetheless. And because of their relatively friendly price point, well positioned to achieve mass success. Nintendo's racing car series Lefty RX (レフティ ＲＸ) is an early example of this approach. In the 70's, wireless remote controlled cars were still in the early stages of their development, very much cutting edge and highly desirable toys. And usually also very expensive, because of the advanced electronics and mechanical parts involved. One of the front-runners in this field, Japanese company Tamiya, released its first model in 1976. 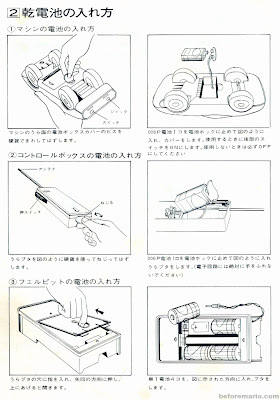 Four years before this, Nintendo was able to provide a racing car that was one of the hot toys of its time, by stripping down the required parts to the absolute minimum. The basic Lefty RX set cost "only" ¥4.980. By comparison, the 1976 Tamiya car (admittedly more advanced) was almost four times as expensive. 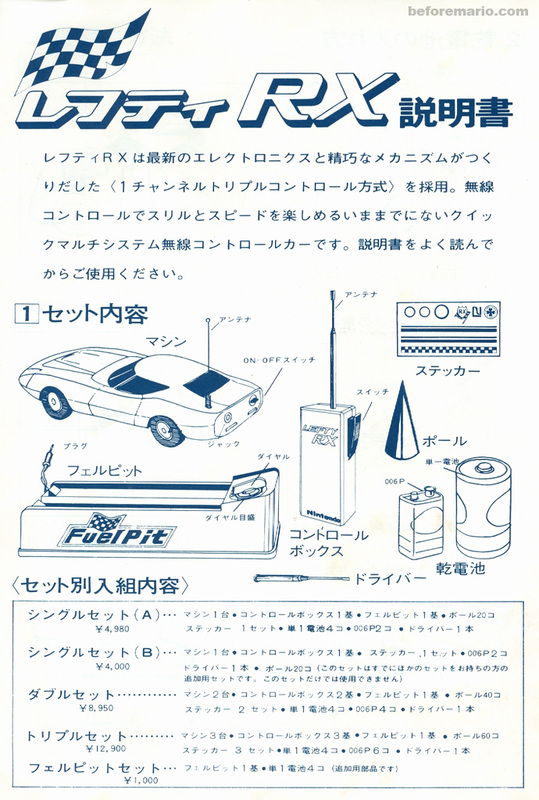 This starter set was called Lefty RX Single Set A (シングルセットA), and contained one car, a remote control, a charging station, batteries, a small screwdriver and a sticker sheet. The "A" extension in the name is somewhat superfluous, as there was only one type of Single Set released. Three different car color were available: red, blue and gold. A sticker on the side of the box indicated the color of the car inside. The "RX" in the name most likely is a play on "RC", the common way of naming Remote Control cars. And here it comes: the series is called "Lefty", because the cars can only turn left! That's right, they cannot turn right. At first, this may seem like a very strange, even idiotic design decision; cars that can only turn one way. 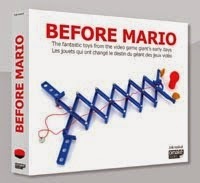 But it is actually a very clever idea, and at the heart of what made this toy possible without it becoming technically too complicated and too expensive. The Lefty RX car is a slick sports coupe. It is made from plastic, with rubber tires. An antenna is sticking out of the back. 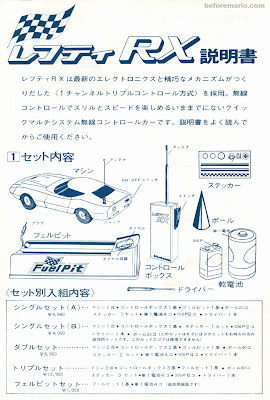 A sticker sheet is included, which can be used to decorate the car with a number and sports stripping. 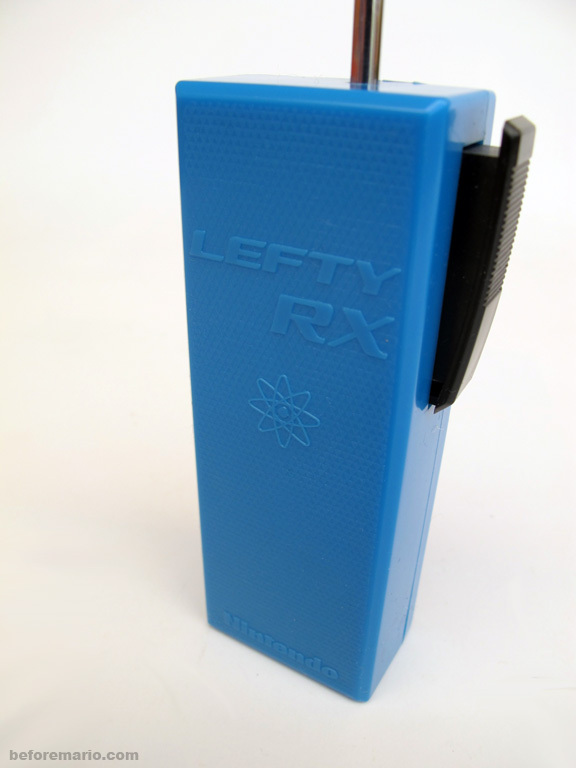 Lefty RX is battery powered, and requires six batteries (provided with the set). The electronics in the car and remote both use a 9 volt block. The charging station takes four D cells. 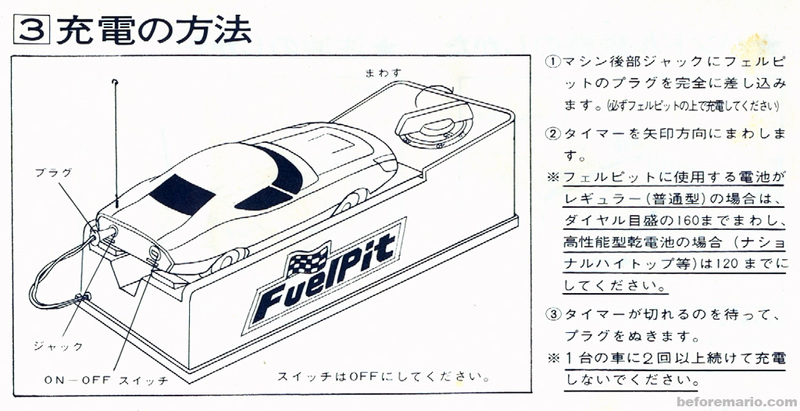 The car has an on-board rechargeable battery for the motor, which is charged by connecting to the charging station called Fuel Pit (フェルピット). The charging station connects with a jack plug to a connector in the back of the car. You have to make sure the car is switched "off" during charging. 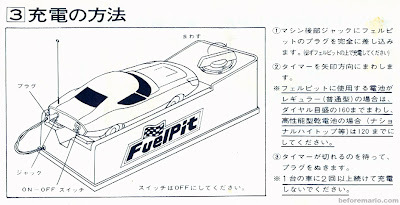 After connecting the car, you set the charge time by turning the dial on the top of the Fuel Pit. When you release the dial, the charging starts. During charging, which takes around three minutes, the Fuel Pit will produce a nice ticking sound, much like an egg timer. When the dial stops turning, the car is charged and ready to use. Dial used to set the charging time (in seconds). A full charge is 140 seconds. The Lefty RX car is operated through a dedicated remote control, which has the same color as the car. Each color car-remote pair is set to a unique transmission frequency, which allows multiple cars to be controlled individually at the same time; essential if you want to stage a race. Regular RC cars have many control options: moving forward and reverse, moving at various speeds and turning left and right. This requires complex electronics, to transmit these different commands from remote to the vehicle, as well as complex mechanics (motors, gears etc) in the vehicle to execute these commands. Lefty RX does not have all of these different controls: the remote has a single push button. That is all you need to control the car. You place the car at the start line (スタート) and turn the car "on" using the switch on its back. It is now ready to go. When you push the button on the remote (押し続ける) it will speed forward in a straight line, and continues straight for as long as you keep the button down. To turn, you release (はなす) the button on the remote, and the car will automatically make a left turn (the only type of turn it is capable of). When the car has made the desired turn, you press the button, and the car will start going straight again. And so on. This way, all you need is a single command on the remote control to let the car zoom around a track counter clock wise. The turning mechanism is as simple as it is clever. If we flip the car over we can get a better view on how it works. In the neutral position, with the power switched off, the front wheels are facing leftwards. A spring keeps them in this position. The car is driven by an electric motor, connected to a single wheel: the front left wheel. When the motor is switched on (by pressing the button on the remote), the force on the single wheel will pull this forward - aligning the wheels in a straight line. As long as the engine is running, the car will go straight. When the motor is switched off (by releasing the button on the remote), the wheels will fall back again in the neutral position, and the car will steer to the left, while it rolls on (for a while) because of the momentum it has gained when racing straight. As a result of the way this works, you need to alternate between going straight and turning. Because the engine stops during the turning, it first needs to get some speed before it can make it through a turn. It requires some skill to maneuver the car around, but this only adds to the excitement during a race. 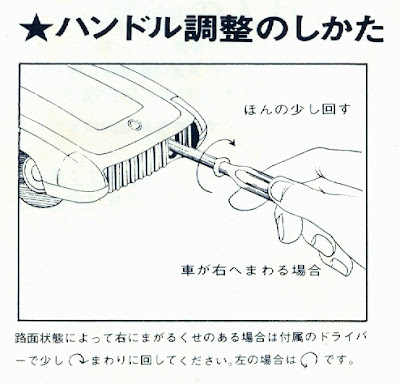 You can adjust the alignment of the front wheels in the "straight ahead" position with a turning knob in the front of the car, using the screwdriver provided with the set. This smart control mechanism allowed for a car that was easy to produce, with limited parts: relativity simple electronics and a single electric motor directly driving a single wheel. But still offering the thrill of a remotely controlled race. Besides the Single Set, the Lefty RX series contained three other sets. Racing is most fun when multiple cars are involved, and two sets were available to kick-start a racing tournament. 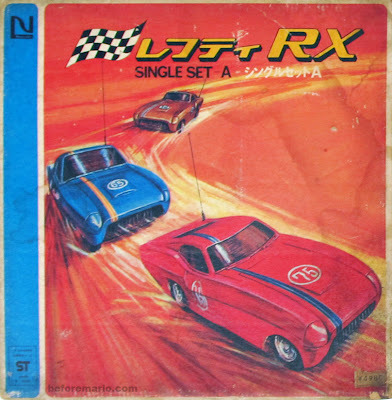 The Lefty RX Double Set (ダブルセット), as the name suggests, contains a pair of cars. It cost ¥8.950. The sticker on the side of the box indicates which car colors are included. The Lefty RX Double Set consists of two cars and matching remotes, a single Fuel Pit and batteries to power these. Additionally, some plastic cones are provided, which are used to build a track to race around. There are no prizes for guessing how many cars are included in the Lefty RX Triple Set (トリプルセット). The Triple Set was the most luxurious Lefty RX set. It cost ¥12.900, a small fortune at the time. Because of its price, it must have sold in small numbers, as is evident from its rarity these days. This set contained all three car colors and remotes, a Fuel Pit, as well as cones to build a track. No less than six 9 volt batteries are included, to power all cars and remotes. Receiving and opening this set on your birthday, or any other occasion for that matter, must have been fantastic. For the eagle-eyed amongst us, during the production run of Lefty RX, the car body changed slightly. Two versions exist, that can be recogniozed most easily by the differently shaped headlights. The Lefty RX Double Set and Triple Set came with a single charging station. For those who wanted to charge multiple cars simultaneously, additional Fuel Pit Sets (フェルピットセット) could be bought as an accessory for ¥1.000. 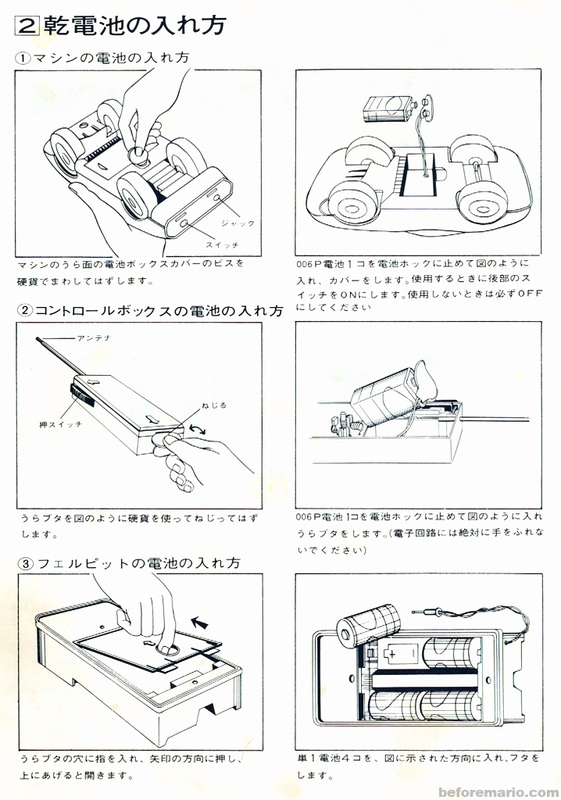 The Lefty RX series was very successful, and Nintendo quickly extended the range with two new car variants: Lefty RX G.T Sport and Lefty RX Proto-Type. We will take a closer look at these two in this post. Brillant post. I love the design of the cars, they just look so sleek. 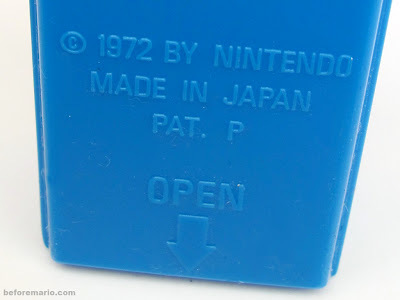 Very interesting too how Nintendo was making toys with a simple design to keep costs down even before the Famicom/ Game Boy etc. Hi Sean. Thanks! If you ask Santa, I am sure a set will pop up soon in the bargain bin at Omocha Souko! That a marvelous Lefty series you have !